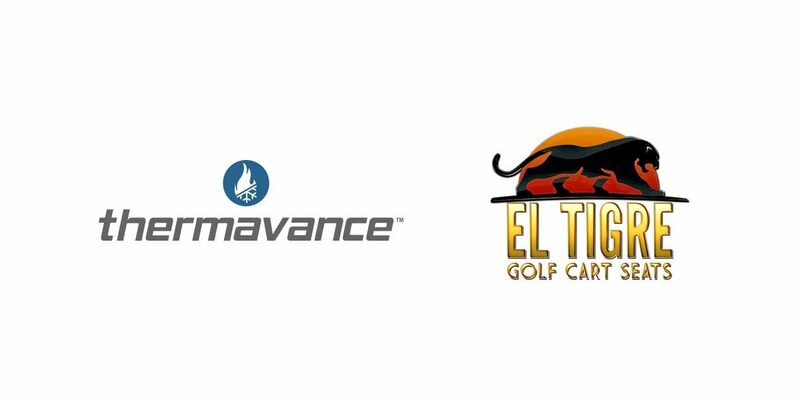 Traverse City, Mich. (June 1, 2018) – Thermavance, a new personal heating and cooling technology, will be available in El Tigre custom made golf car seats beginning summer 2018. Thermavance brings “human scaled climate control” to outdoor seating exposed to the elements, including golf car seats. The system is durable, adaptable and connected making the technology ideal for the high end, custom golf car seats produced by El Tigre. El Tigre’s unique style features contoured comfort, superior craftsmanship, premium materials, creative finishing touches and unlimited customization possibilities, which will now include Thermavance. El Tigre’s many years of experience in the marine, RV and home furnishings markets have provided a wealth of knowledge in regard to the use and understanding of materials and components available for future creative and functional designs. Thermavance electronically heats and cools the seat surface using thermoelectric devices and the nano-material, graphene. The graphene serves as a pathway through which heat moves to either heat or cool the seat occupant. Thermavance is a product of Promethient.